Bullish on security, conservative in diplomacy — ending weeks of silence, retired Israeli general Benny Gantz has launched his campaign to become prime minister. What did his maiden political speech delivered on Tuesday reveal about his chances of beating long-term incumbent Benjamin Netanyahu in April’s election? 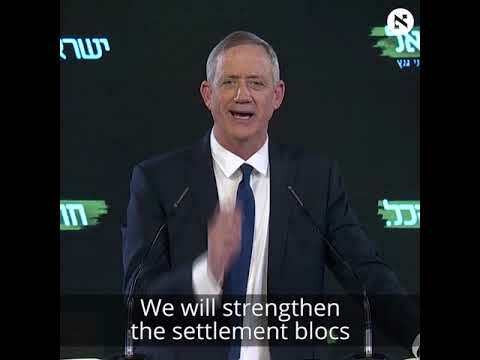 In a short speech at a Tel Aviv convention centre, Gantz announced his intention to succeed Netanyahu as prime minister and made public his opinions on key issues. Gantz promised a conservative diplomatic and security policy, keeping up a tough stance on Iran and its military presence in Syria, which borders Israel. Regarding the Palestinian issue, Gantz pledged to keep the strategic Jordan Valley area of the occupied West Bank under Israeli rule along with annexed east Jerusalem. Polls conducted since the founding of his party Israel Resilience in December indicate it is likely to emerge as the second largest in parliament at the April 9 election. Netanyahu’s Likud party is predicted to win the largest number of seats, but the veteran premier faces potential corruption charges that could cost him votes. “The very thought that a prime minister can serve in Israel with an indictment is ridiculous to me,” Gantz said in his speech, leaving open the door for a possible coalition with Likud if Netanyahu is not formally charged. Gantz lashed out at the Netanyahu government’s “ferocious attacks against the chief of staff, commissioner and attorney general,” vowing that under his rule, “there will be no incitement against the judicial, cultural and media institutions”. Gantz thanked Netanyahu for his “10 years of service”. Gantz also attempted to avoid alienating voters from either side of the political spectrum with vague messages against “the struggle between left and right”. “We are one nation,” he said. The speech was heavily criticised by members of Likud, with Netanyahu, who in the past praised Gantz’s leadership of the military, calling him a part of the “weak left”. All his “laundered words” cannot conceal the fact he is “a member of the left,” who would form a left-wing government if he could. Naftali Bennett of the right-wing Hayamin Hehadash echoed the sentiment, calling Gantz a “good man” but a “very weak” one, saying he was a part of the left and it would endanger Israel for him to be defence minister. Bennett and Gantz are both seen as potential defence ministers under Netanyahu in the likely event they fall short at the election and join a coalition with Likud. Centrists Yair Lapid and Avi Gabbay, who risk losing most votes to Gantz, were silent on Wednesday. While Gantz’s appearance was well received by large parts of the Israeli press, it is still too early to determine how he will fare at the election, said Gideon Rahat, a professor of political science at the Hebrew University. Rahat noted that Gantz’s alliance with hawkish former defence minister Moshe Yaalon, announced on Tuesday, could be a way to appeal to softer right-wing voters. “It’s all a matter of (swinging) a few percentages of votes from the right, religious right to centrist parties. This is the main issue at the end of the day,” Rahat said. A poll published Wednesday by Israeli news site Walla! gave Gantz’s party 19 spots in the 120-seat parliament, up from around 12-13 in polls before his speech. The survey of 1,009 Jews and Arabs, conducted by Panel Politics, showed Netanyahu’s Likud slipping to 29 seats from a previous 33.